"Exclusively By Christine" was created in 2010 by Christine Rigby in order to fill what she thought was a need for quality, individually designed and handmade accessories. Christine has spent the whole of her working life on the Isle of Wight in a professional manufacturing environment as a high grade sample machinist / dress maker. 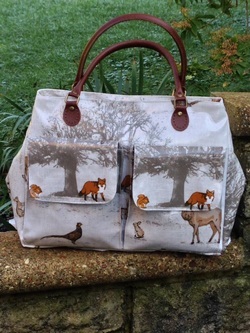 Bags produced in the "Exclusively by Christine" range include small, medium & large satchels, Purses, Travel bags and Baby Changing Bags. All can be ordered on-line. "All bags and mats are fully lined in beautiful floral or plain fabrics and include zips or metal poppers. I hope you enjoy looking through the store and look forward to hearing from you.